Designer Keith Foster did Lone Star state golfers right at Texas Star G.C. It took this city long enough, but once Euless decided to build a golf course, they did it right. Looking back there was so much one could second guess. They named it Texas Star. Who would be bold enough to name a golf course Texas Star in the proud Lone Star State -- that's just setting you up for a letdown. Then they put it smack dab in the middle of Pipeline Road's industrial area -- another potential mistake. But the second guessers are gone. Renowned golf architect Keith Foster was picked to design it. He created a strategic par-71 test of 6,936 yards with targets and options in abundance. Foster sculpted it out of 275 acres of rolling terrain with 100-year old oaks and natural woodlands, tall native grasses and Hurricane Creek traversing through it. Texas Star became a stroll in the Texas Hill Country, instead of a walk through an industrial park. All this right in the middle of the Dallas-Fort Worth Metroplex, only minutes away from D-FW Airport. 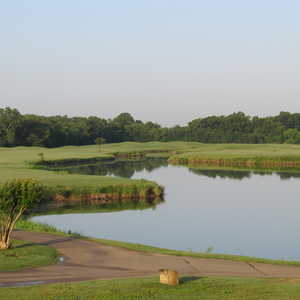 No doubt Texas Star Golf Course is one of the elite upscale, daily-fee golf experiences in Texas. "This can be a very difficult course, especially when you play from the back tees, and when the pins are in tough places," said Duff Cunningham, the Head PGA Golf Professional and a native of Cleburne. "The greens have very subtle breaks and they are hard to see, but G2 bentgrass it is one of the best putting surfaces you will see anywhere. 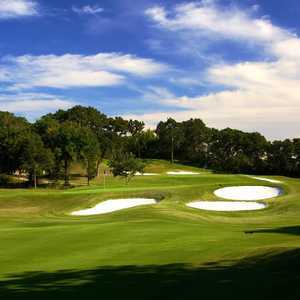 When it opened in May 1997 it was the first golf course in Texas to use Penn G-2 Bent Grass greens, Cunningham said. That certainly has been a struggle in the Texas heat. The greens were lost last year, but the management has a plan to preserve these great putting surfaces. When the triple-digit temps arrive, Texas Star limits play to 100 golfers per day and they try to confine the number of golfers on the course during the hottest times of the day. The course is closed on Tuesdays. The only negative is that at times Texas Star is a cart path only golf course -- one of the greatest promoters of slow play. Signature hole? Foster thinks there are 18 of them, but the finishing holes are really intersting. No. 9, a par-4, 422 yards, is the No. 2 handicap hole. It's named Devil's Point and requires thought for the long hitters. There's water crossing the fairway about 100 yards out. In fact, you must contend with water on holes 2, 8, 9, 10, 11, and 18. Other obstacles include ridges, grass bunkers, sand and Scottish-links style eyebrows -- which are basically protrusions and upheavals of turf right there in the middle of the fairways or spots you wouldn't imagine. Johnson's Crossing opens the back nine with an uphill tee shot on a 539-yard par-5 that slopes left. The tee shot must clear two large fairway bunkers, then you have to negotiate the creek which crosses in front of the green. Double Barrel on 11 gives you the option of going low left or high right on the tee shot. It's only a 337-yard par-4, but there are three bunkers surrounded by thick grass on a ridge in the middle of the fairway. On 13, Coyote Bluff, you have a blind tee shot that doglegs slightly left. Hit a good one and you can see the green well below you on this 414-yarder. Battle Cry, the 370-yard par-4 15 is the best-looking hole with a waterfall centerpiece. You have the option of hitting it long and right over the creek to have the best angle to the green. You can also hit it straight and short of the creek, dodging a bunker, to have an uphill shorter second shot. Presidio, the short and scenic 179-yard downhill par-3, follows as No. 16. The hole spotlights a stacked rock wall edging the creek on the right. The finale, named Deguello, is a par-5, 535-yarder filled with target options. There's water on the first and second shots and average players will have to hit a shorter second shot because the creek crosses the fairway. You will also have to steer clear of a fairway bunker right near the 150-yard pole. Big hitters going for the green in two have to watch out for hanging the shot right, because the creek passes to the right of the green. "I never thought I would find a course this nice anywhere in this part of the country," said Mike Conners. "It's a tough course -- a lot of water, a lot of hazards, a lot of trees, rolling hills, fantastic greens, beautiful views, great staff and wonderful clubhouse. When you first drive up to the course you are in an industrial park. Don't let first impressions fool you. It is one of the most interesting courses I have played. "I may sound prejudiced, but I have played courses all over the world, to include Japan, Korea, the Philippines, Hawaii, Italy, Germany and the Caribbean. Only one course I have played is as interesting as the Texas Star course and that is the Princeville course in Kauai! I recommend this course to everyone I meet. After playing Texas Star you will want to throw rocks at most courses you have played." 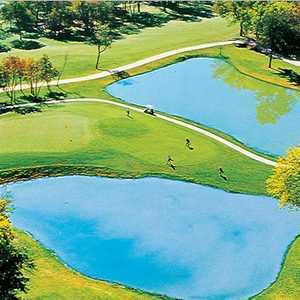 "I like the fact that every hole seems to be unique and has it's own special characteristics," said Joe Dryden of Euless. Texas Star is a winner and it's unique -- from the rustic water cooler setups (the wood and tin were rescued from an old barn demolition) to the clubhouse that looks like a Hill Country ranch house. There's even the Raven's Grille where you can get a chicken-fried steak that will cover your plate. Texas Star offers individual and corporate memberships. Call for details. Green Fees: Prime $53. Twilight fees are available at certain times of the year. Cart Rental $12 per person. Directions: From Dallas, go west on Hwy 183 and take 157 south, turn right on Pipeline Road and watch for the Texas Star sign. Turn left on Texas Star Parkway. From Fort Worth go east on 183 and take Westpark Way south or right. Watch for Texas Star sign and turn right on Texas Star Parkway. Upcoming Texas reviews: Tour 18 Dallas and The Golf Club at Fossil Creek. Also, Austin's Barton Creek. San Antonio's La Cantera and The Quarry. Great course...things have changed since this review, they are open on Tuesday and it is only cart path when there is a heavy rainfall that leaves the fairway soggy. Normal rate of play is consistent on the course. It has been in great shape each time I have played the course... love the bentgrass greens.